You’ve invested time and energy in developing your model and classification strategies, keeping them up to date ensures continued success. 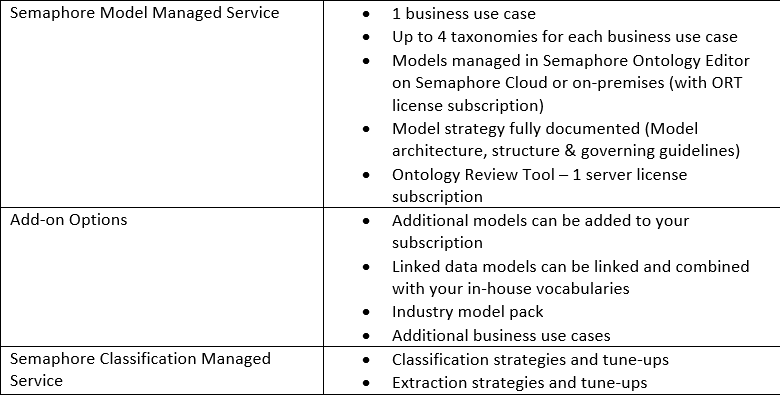 Smartlogic’s Semaphore Managed Services (SSMS) offering guarantees your model and metadata are well managed and kept in synch with your business use case. Our Information Science experts use a documented and well-tested approach to model development and classification to ensure your results are flexible and reflect the changes in your organization and use case over time. Whether you’re improving customer experience, enhancing information discovery or automating workflows to gain insight from volumes of data, you need a complete set of information – structured and unstructured – to make informed decisions. The subtlety and variety of human language make it difficult to identify the meaning of a given word or phrase without understanding the context in which it’s used. Semantic technologies close the gap between data collection and data value by leveraging models and sophisticated semantic strategies such as AI and machine learning, to make data complete, relevant and accurate - smart. Semantic models - taxonomies and ontologies - are the key to transforming information into trustworthy enterprise knowledge but only if they can easily incorporate new information as it evolves. Representing knowledge using semantic models provide a mechanism to express the relevant concepts, labels, associations, hierarchies, and context within an organization and use that knowledge to effectively manage data for your business systems and users. including, life sciences, financial services, high tech manufacturing, government, heavy asset management, and media and publishing. We’ve helped many of the world’s most advanced enterprises implement semantic solutions using Semaphore as the engine. The success of these projects is a combination of the Semaphore platform and Smartlogic’s proven expertise gained from implementing hundreds of projects. The Smartlogic Managed Service offering guarantees that your models are well maintained and up to date. If you subscribe to our Classification Managed Service, your metadata creation will be monitored and optimized to the highest quality. Our team collaborates with your business users, subject matter experts and in-house information team using Semaphore’s Review Tools, so that you can quickly incorporate new information and put your model to work solving real business problems throughout the enterprise. Our reputation relies on your success, so we make sure we can meet your needs before we make a commitment. And when we make a commitment, we back it up. Our SSMS offering guarantees your model is fit for purpose and in synch with your use case so you can focus on what matters – leveraging your model to drive your business. To learn more about Semaphore Managed Services, contact your Sales Account Manager Today.